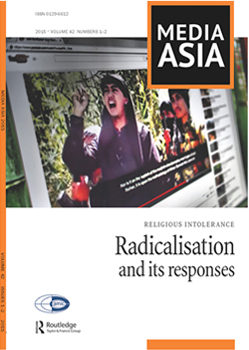 Media Asia is a quarterly magazine which serves as an important platform for the exchange of views and information on mass communication in the countries of the Asia-Pacific region. Each issue of the journal has valuable information, views and comments relevant to communication professionals, scholars and laymen. Welcome to the new Media Asia. Since 1974, Media Asia has helped to fulfil AMIC’s mission of nurturing and promoting research and dialogue on media and communication in the region. Entering our fortieth year, Media Asia remains focussed on this role. But, starting with this issue, we will be approaching it in a whole new way. The most obvious change is in our physical format. We’ve abandoned our old A4 size for this new compact package. Our new dimensions mirror AMIC’s other journal, the Asian Journal of Communication, to emphasise the complementary roles that we play. It is between the covers that you’ll find the most significant changes. The core of this journal will remain: In each issue, we will still publish several original scholarly research articles blind-refereed by experts in the field. Media Asia’s Research section leans towards empirical studies with a fairly direct impact on practical challenges in Asian media and communication. In line with this continuity, Sundeep Muppidi remains in charge of our research section. 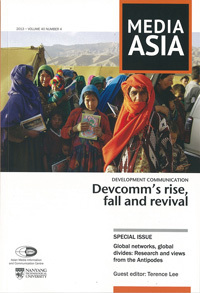 In addition, the new Media Asia contains substantial new sections highlighting current ideas, trends and concerns. Each issue starts with in-depth, journalistic reportage, a feature article analysing a major topic of contemporary interest. In our insights pages, authoritative thinkers and leading practitioners share their opinions on key issues. There is also a section highlighting noteworthy works. Here, we’ll review not only books but also relevant online reports, documentary films and other resources that merit your attention. We are also excited about our new casefile section. Despite the huge growth of Asian media and communication activities and education, there is a crying need for well-written, easily accessible Asian case studies to use in teaching and research. Media Asia will do its part to help fill the gap. All thesechanges are guided by our assessment of the strengths and limitations of conventional academic journals. Most journals are dedicated to showcasing the fruits of scholarly work, in the form of peer-reviewed research articles. But, this is only one part of the life cycle of scholarly inquiry. Before new findings are ready for harvesting, the soil has to be tilled and seeded with the right questions. And, after research is published, we need to take stock of how new knowledge is being used on the ground. We’d like to think of the new Media Asia as contributing to this wider ecosystem. We aim to serve readers who want to harness reliable research and credible, critical insights in order to address contemporary media and communication challenges in Asia. We want to connect researchers, educators, students, practitioners and policymakers, by publishing not only the new findings contained in research articles, but also signposting new directions for research and flagging pertinent questions. Of course, we will be only as good as the contributions we receive. Please consider Media Asia as an outlet for your research, following the submission guidelines on page 96. If you are interested in contributing to our other sections – Insights, Casefile and Noteworthy – please refer to www.mediaasia.info for more details.